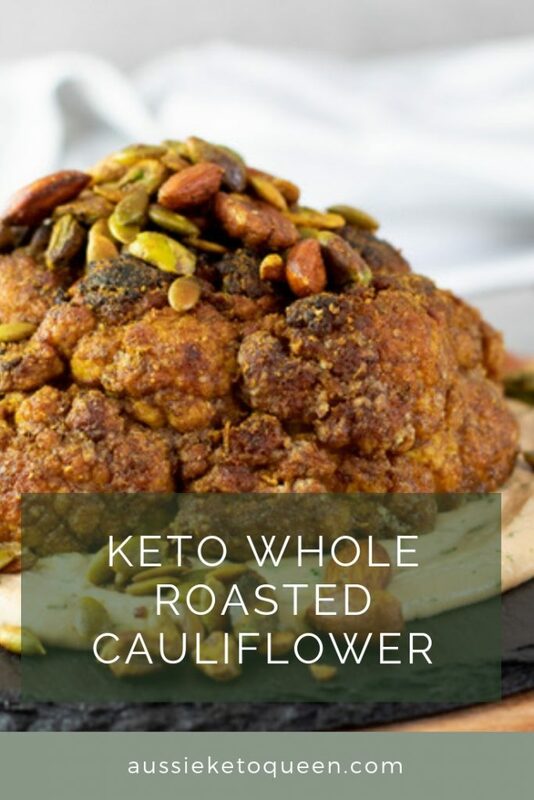 This Whole Keto Roasted Cauliflower ticks so many boxes for me. I haven’t been so excited about a recipe in a LONG time. It is vegetarian, could easily be made vegan (sub the ghee for coconut oil), delicious, easy and LOADED with flavour. 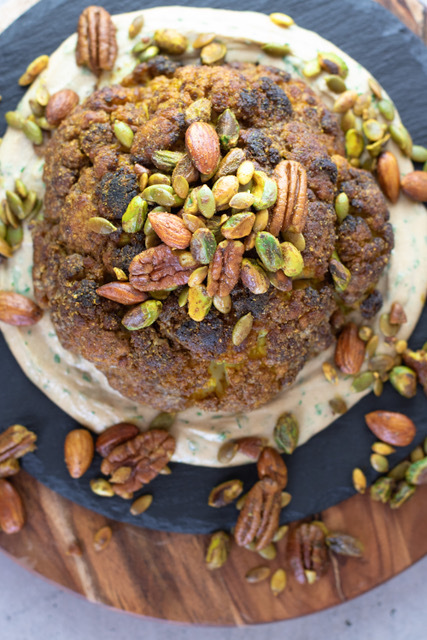 This recipe was lovingly created by Dan and Erika from Have Butter will Travel. 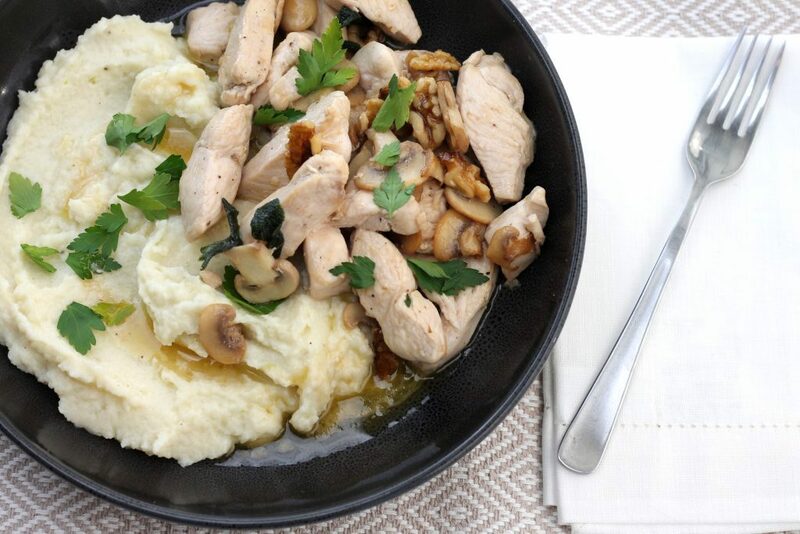 We have collaborated with this recipe swap, and I made this Keto Chicken with Sage Burnt Butter sauce for their website. With a name like Have Butter Will Travel, what choice did I have? I’ve learnt over the years of running this website that collaborations and the blogging and keto communities are really awesome. We all support and help each other to bring our readers better and tastier recipes! We currently live in Melbourne, Australia and started Have Butter will Travel so we can share our two passions – low carb/ keto eating and travelling. We are super passionate about sharing what we have learnt in the 2 years that we have been living a ketogenic lifestyle. We also love to share our experiences of travelling on a ketogenic lifestyle. We have discovered a new way to travel, which is finding the best keto friendly food options in each place we visit. Our blog has some great articles on the best keto eats in various cities we have travelled to. Check them out here. You can follow along with our keto adventures on Instagram, Facebook & YouTube. 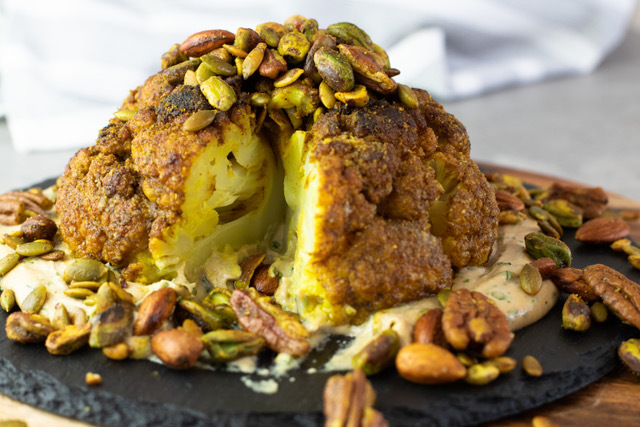 Middle Eastern flavours pair so well with cauliflower. 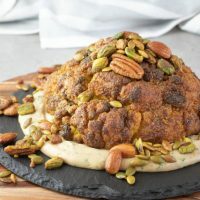 This recipe uses some of the classic Middle Eastern flavours including tahini, cumin, turmeric, garlic, cinnamon, ginger and coriander. Tahini is a creamy, nutty paste made from sesame seeds, so basically a sesame seed butter, which is a popular Middle Eastern ingredient. It is great to use in baking in place of nut butters as it is lower in carbohydrates. Tahini is also a useful option for making sauces and salad dressings, particularly if you are dairy free, as it can add a lovely creamy texture. Cauliflower is a popular low carb vegetable. At 5g total carbs per 100g it’s an excellent replacement for potato or just about anything really! You will find a lot of low carb substitutes use cauliflower. These include cauliflower rice, cauliflower pizza crust and cauliflower mash. Roasting a whole cauliflower is an excellent way to cook cauliflower. To speed up the cooking process, it helps to par-cook the cauliflower in the microwave. Roasting the cauliflower in the oven allows it to dry out slightly and adds a delicious roasted flavour to the cauliflower. I LOOVVEEE short cuts and this one has got me roasting my cauliflowers whole. I had always been put off because I kept googling recipes that said it will take ages to roast a whole cauliflower, and often they looked burnt on the outside and crunchy on the inside… yuck. None of that here, just delicious roasty nutty flavours and so much flavour. 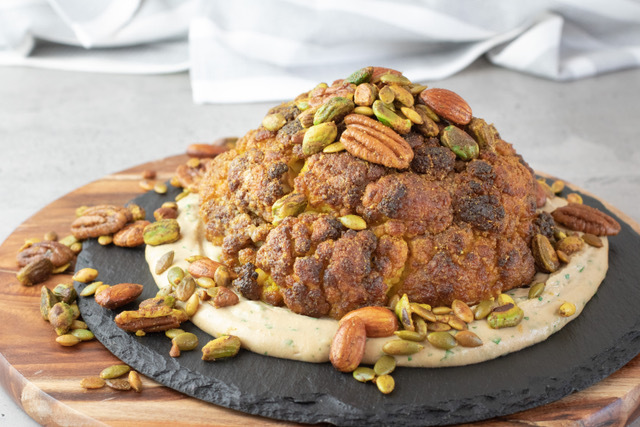 This whole roasted cauliflower is easier than you think, and has some IMPRESSIVE flavours. 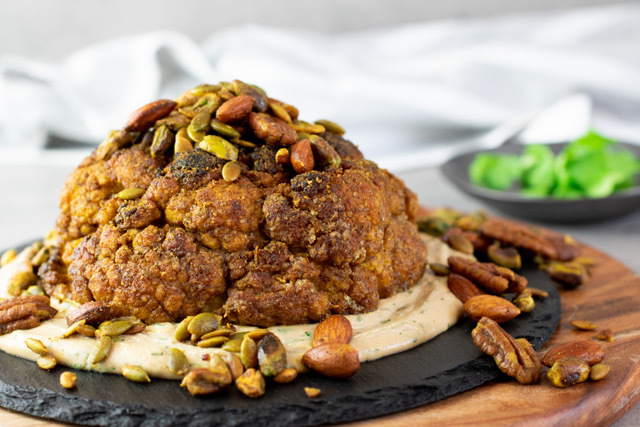 Paired with a nutty crunchy topping and tahini sauce, you will impress your guests with this one. 1. In a small bowl, combine the spices for the spice mix. 1. Take 2 tsp of the spiced ghee mixture and heat in a small frying pan/skillet over a medium heat for 1-2 mins or until fragrant. 2. Add nuts and cook for approximately 5-7 minutes to toast the nuts, stirring regularly to make sure they don't burn. 1. In a small bowl, combine the tahini, garlic powder and lemon juice, stir until mixture is completely combined. 2. Add the chilled water 1 tbsp at a time and mix, until sauce is the desired thickness. We like it to be creamy but still thick so it is spreadable and not too runny. 3. Add the chopped coriander leaves and set aside. 1. On your serving plate, spread the sauce evenly in a circle. You will want the sauce spread to be slightly bigger than the cauliflower. 2. Place the whole roasted cauliflower in the middle of the sauce. Top with the spiced nuts and sprinkle them around the outside of the sauce also. Garnish with additional coriander leaves if desired.